You'll be £19.99 closer to your next £10.00 credit when you purchase Commuter City. What's this? On the eve of the railway age, London was the world s largest and most populous city and one of the most congested. Traffic-clogged roads and tightly packed buildings meant that travel across the city was tortuous, time-consuming and unpleasant. Then came the railways. They transformed the city and set it on a course of extraordinary development that created the metropolis of the present day. This is story that David Wragg explores in his fascinating new book. He considers the impact of the railways on London and the Home Counties and analyses the decisions taken by the railway companies, Parliament and local government. He also describes the disruptive effect of the railways which could not be built without massive upheaval. His study of the railway phenomenon will be thought-provoking reading for anyone who is keen to understand the city s expansion and the layout of the capital today. This book falls outside our normal subject matter, looking at the development of the railways in London and the impact they had on the city. Two chapters are directly relevant to military history, the two that cover the World Wars. These two chapters do rather nicely illustrate the dramatic change that took place between the two wars. In the Great War the main impact came from an unexpected level of government control and the disruption caused by troops trains. In contrast the Second World War caused a great deal of disruption and damage to the railways. Surface and Underground lines were both vulnerable to bomb damage and even the deep lines weren't entirely safe. The Tube was also famously used as a massive bomb shelter. The war also had a less obvious impact - a lack of staff meant that trains and stations became increasingly shabby. This and the wider impact of the war played a part in the eventually nationalisation of the railways. London in the 1800's was chaotic and congested and finding ways to overcome this proved difficult. then came the railways - they transformed the city and the surrounding Home Counties. In 1906, an outlying district like Golders Green was a muddy country crossroads without a building in sight, but by 1939 it had become a built up, affluent suburb. The arrival of the railway had an enormous and irreversible impact on London - at the time the largest and most populous city in the world. As well as the immediate transformation brought about to the previously horrendously congested roads, the railways' arrival kick-started a new era of development that led to the creation of the famous and distinctive London as we know it today. In Commuter City we learn the fascinating history of the railway age and, specifically, its impact on London and the Home Counties. Analysis of the the decisions made by those in charge (including parliament and the local authorities) gives further insight into the complexities of operating such a dense transport network and also into the ways that a metropolis such as London comes into being. Along the way, the book relates some very interesting and often surprising stories, such as how the railways were routed through the slums so that the rich and influential landowners weren't disrupted by the development. We also learn how the tube stations were used as air-raid shelters during the second world war, with sometimes devastating consequences. 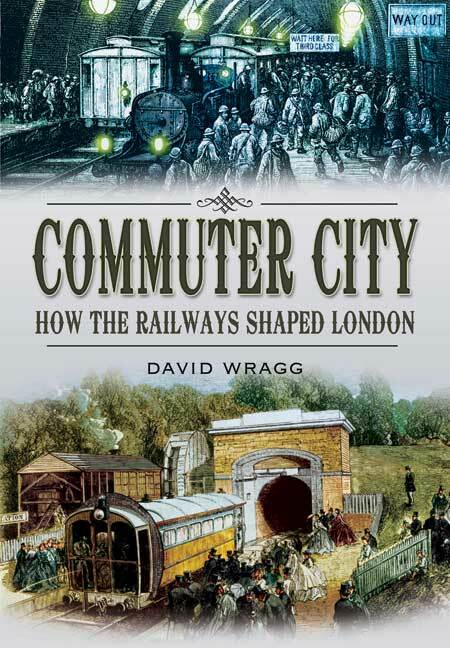 Wragg's book is a compelling and highly informative examination of the railway phenomenon - it will be of great interest to transport and rail enthusiasts and is a thought-provoking read for anyone with an interest in urban history and the city of London itself.